Only users with "Account Owners" or "Make Payments" privileges in Kanbanize can renew the subscription. If you have an annual subscription, the system will automatically send a series of reminders over the provided Payment Notifications email. The first email is sent 45 days before your account expiration date. You will also get a system message 14 days before your account expiration date (img.1). 1. How to Renew your Kanbanize plan? 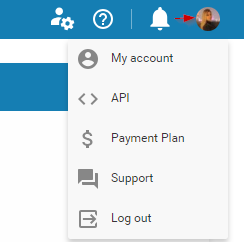 Step 1: To renew your subscription -> access your account and click on your avatar at the top right side of your board interface -> select Payment Plan from the menu. Step 3: You can renew your subscription without any updates in your current plan. If you wish to upgrade/downgrade your plan i.e. 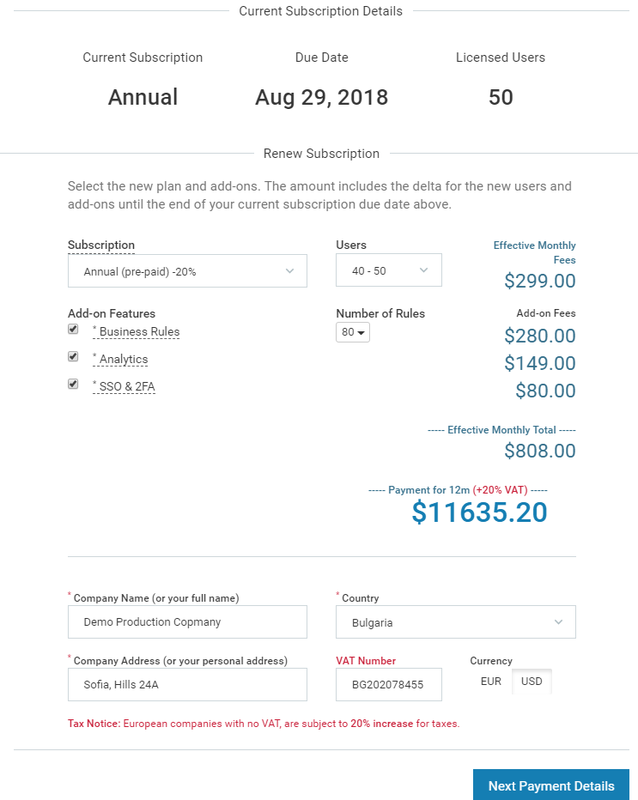 switching the subscription, increase/decrease users, add/remove add-on features; change the number of your business rules -> just make the changes in accordance with your needs. Note: If you want to decrease the number of users and select a lower tier -> you first must delete or disable the users in your Kanbanize account that will no longer use the system in order to match the new number of licenses. Otherwise, you will get a notification message and the system will prompt you to do so. The calculator will instantly display the new total payment amount -> click on Next Payment Details to proceed with the renewal. 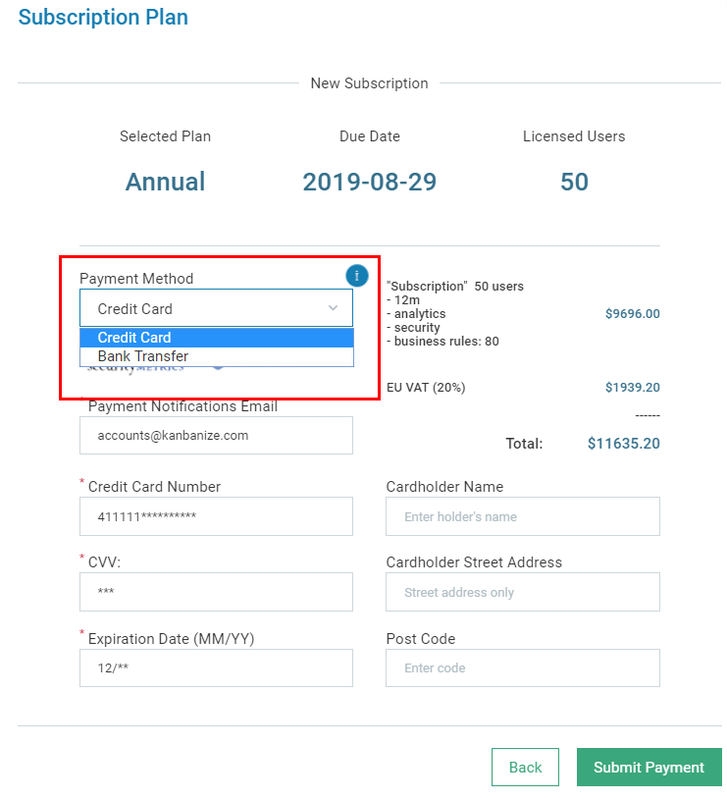 Step 4: The annual subscription can be paid by credit card or bank transfer -> please, define your payment method from the corresponding field (img.4). Note: the monthly subscription can be paid by credit card only. -> if you pay by Credit card, make sure that your credit card details are up to date and click on Submit Payment to confirm the renewal. -> If you choose to pay by bank transfer -> please check your contact details and provide PO number if necessary -> click on Submit to confirm the renewal. * After submitting your subscription, our system will automatically issue an Invoice with the Kanbanize bank details and send it over to the provided Payment Notifications Email. You will have 30 days to make the bank transfer. Upon payment submission, you will get a system message notifying you that the subscription renewal has been successful.